Raising Sadie - Hero Dogs Service Dog in Training shared a post. More Hero Dog puppies are on the way!!! Donate to help raise the next litter of these amazing pups! !Clara's puppies have been keeping a big secret--and now it's time to share it with our community! We are very proud to announce that Hero Dogs Clara Barton is expecting her second litter of puppies! As our loyal supporters you know our breeding program brings an exciting new opportunity for our organization to serve more veterans and first responders. Along with this growth comes the need to provide the best quality care for Clara and her pups, and we need your help. Please consider a gift or donation to Hero Dogs in honor of mother-to-be Clara, who can't wait to be a mom again! Raising Sadie - Hero Dogs Service Dog in Training is in Fairfax County, Virginia. Sadie, you are one lucky girl to have had such a wonderful friend and mentor during this phase of your career. I like to think that as soon as Willow crossed the bridge she was met by service angels who greeted her with hugs and will put her back to dog angel work After she has had a little rest. You are such a good girl, Sadie. 💕 and now have another guardian angel helping you each day. We are so sorry! Willow comforted so many people going through some very scary things. Thoughts and prayers to all of you. A beautiful dog that must have touched so many lives including yours. Doggie Pile, Labrador Style! Hanging with my homies at the @herodogsinc kennel. Can you pick me out of the pack???? 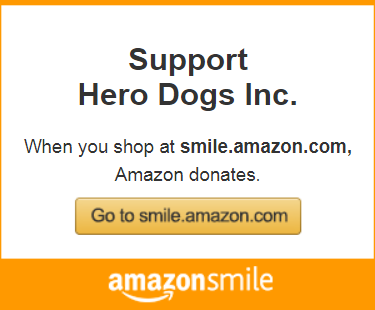 Raising Sadie - Hero Dogs Service Dog in Training is at Hero Dogs. Sadie, we are all soooooo proud of you. Brains and heart. What a very good girl you are! Causey Labradors And Training, LLC is proud of you, kiddo! Sadie Bug checking in from a very busy May! My big news is that you can now follow me on Instagram by following HeroDogsSadie! I ran my first 5k with Girls on the Run this month with Hero Sitter KZ and I got my first medal! Hero Sitter KZ also took me for a special training trip to downtown DC where I met many veterans and visited many important memorials. I also had my first trip to the metro station this month! I’m continuing my weekly visits to GWUH hospital and to work. Everyone really loves when they get my business card! I’m so professional! Hero Dogs Sadie is 9 months old! Sadie Bug the Lady Bug here! I just got back home to Raiser Mom’s place after my very first swap week! 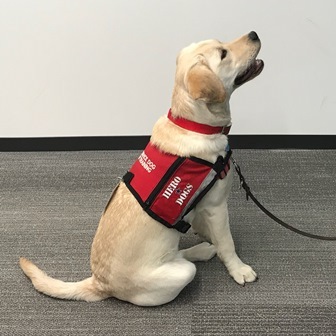 Thank you very much to Ms. Robin (Hero Dogs Honor's puppy raiser) who took such good care of me last week and helped me learn the new skill “paw”. I’ve had another growth spurt and have graduated to a bigger harness and another notch bigger on my collar. My legs also had a growth spurt and I’m taller now! I’ve been working hard at learning “heel” and “side” and how to “stand” for a longer duration. I go to work with my Mom and Ms. KZ at least a few days a week. I’m popular! I enjoy going to meetings and strutting through the hallways. Though, I’m still a pup and need my work powernaps. This month I hit a new record with the “wait” command and kibbles lined up on my legs. I’m such a good girl! I started with just 1, moved up to 6 quickly, and then…. Wait for it….. 14 kibbles!!! Wow!! Click here to read Sadie’s full blog.